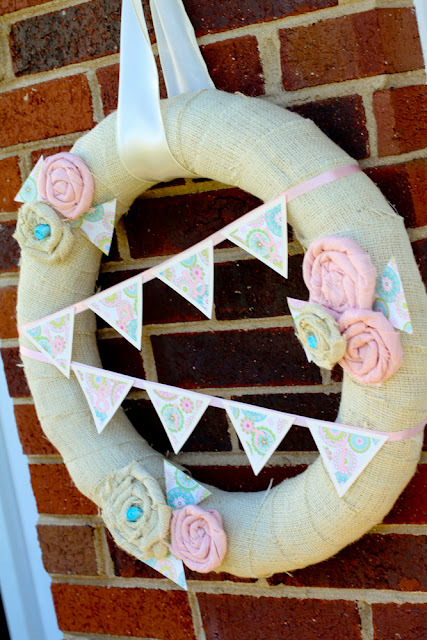 So many possibilities with this burlap wreath! 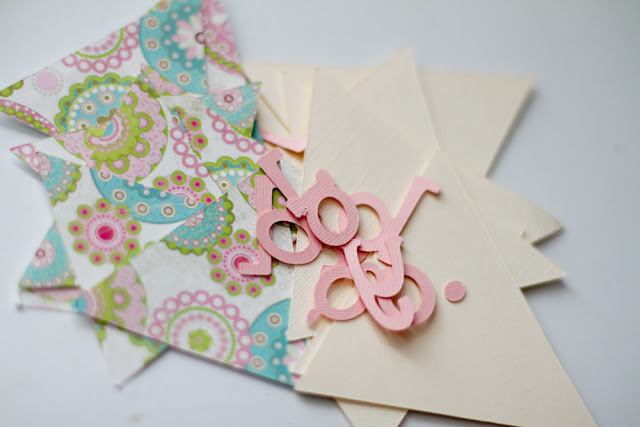 A guest post from Jen at Scissors & Spatulas. 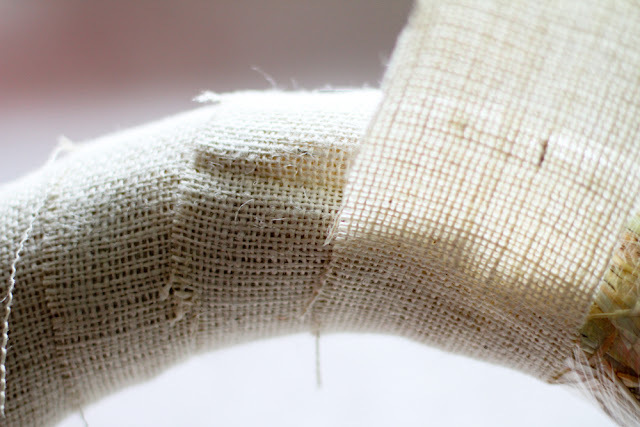 Burlap. We all love it, right? Jen at Scissors and Spatulas made an adorable burlap wreath and she has been kind enough to come on over and share the tutorial. Not only is this wreath super cute, it can be modified for any season or occasion. Hey y’all! I’m Jen and I’m from good ole SC! I’m also a mom, a wife, a housekeeper, a cook, a decorator, a crafter and a blogger. My blog is a collection of everything that I enjoy from DIY projects, home decor, crafts and recipes to fun activities for the kids and our own family experiences. Hence my blog name: Scissors & Spatulas: And Everything in Between! When you visit my site, you never know what you’re gonna get! Vivienne and I have been blog friends for some time now and I’m thrilled to be here guest posting for her! 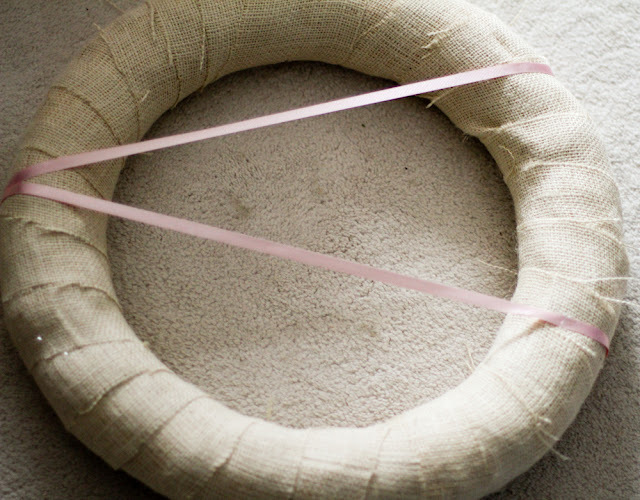 Today I’m going to share with you an east DIY burlap wreath I made for a friend’s baby shower. 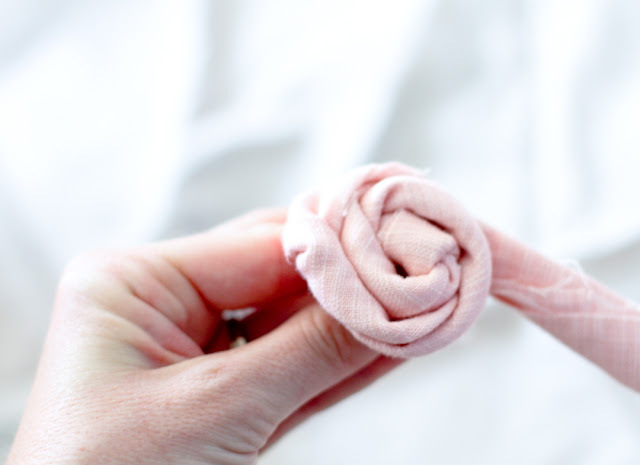 No friends with a bun in the oven? Don’t go away yet. . . this wreath can be changed to suit any holiday or occasion. So my friend was having her first baby, a girl, but she wasn’t sharing the name. I helped throw a shower for her and I was in charge of decor and favors. I looked at a pre-made banner while out shopping but ,me being me, was up for the challenge of a DIY banner! But then I got to thinking, “If I’m going to put the effort into making this banner, why not make something she can use again?” And so I decided to make a wreath instead. This way she could hang it on her door when the baby arrives. So I made my weekly trip to Hobbly Lobby and walked the entire store and came home with burlap, pink linen, a hay wreath, scrapbook paper, and ribbon. This is what I did with it. . . Here is how I did it. . . I cut the burlap into strips about 2-3 inches thick. I wrapped the burlap strips around the wreath using hot glue to secure the fabric on the back side of the wreath. I measured and cut two pieces of grosgrain ribbon slightly larger than the diameter of the wreath. I stretched the ribbons across the wreath and wrapped the excess ribbon around the backside. I secured the ribbons with hot glue on the back side of the wreath. I then used a hot glue gun to attach the pennants to the ribbon. 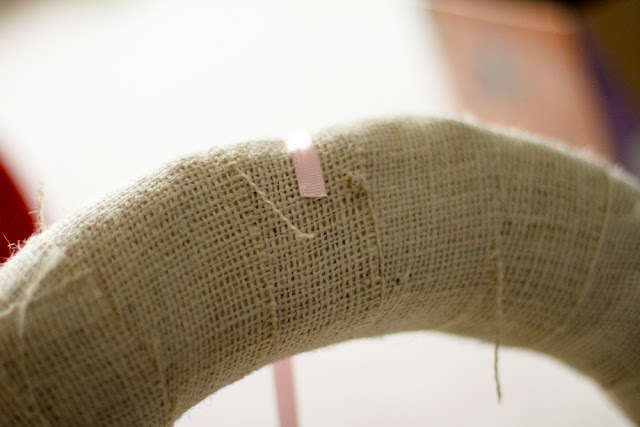 Next I made some rosettes out of burlap and pink linen. 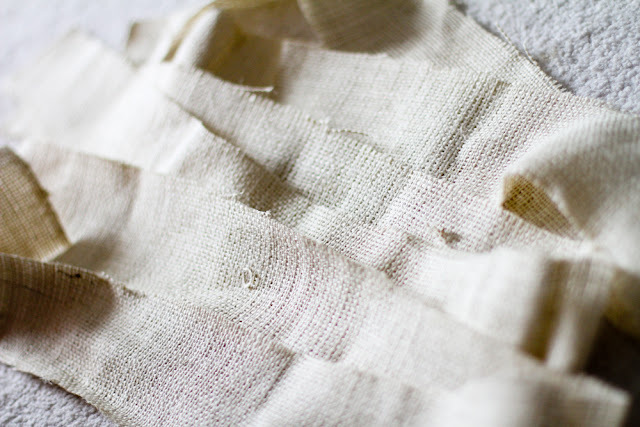 I started by cutting the fabric into three inch strips. 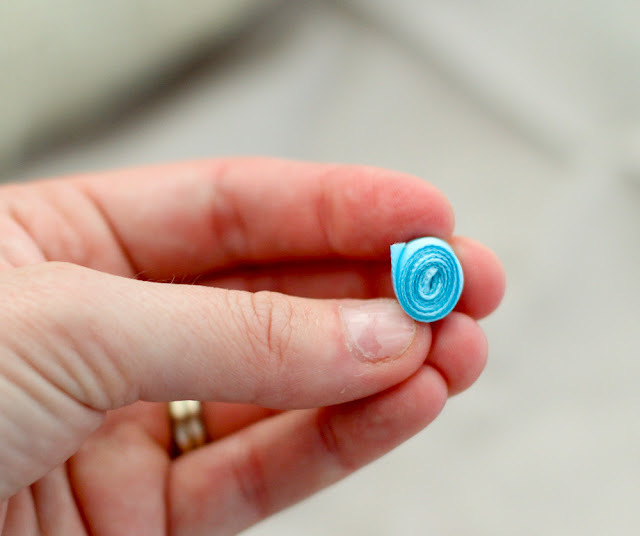 Then I twisted the fabric somewhat tightly and began wrapping around and around in a spiral fashion, securing with hot glue on the under side every other circle. Here is a finished rosette. I tucked the end of the fabric on the back side and secured with hot glue. For the center of the burlap flowers, I rolled thin blue silk ribbon tightly and secured the end with hot glue. I placed the flowers around the wreath and added some triangles from the scrapbook paper to mimic the pennants. And here it is! 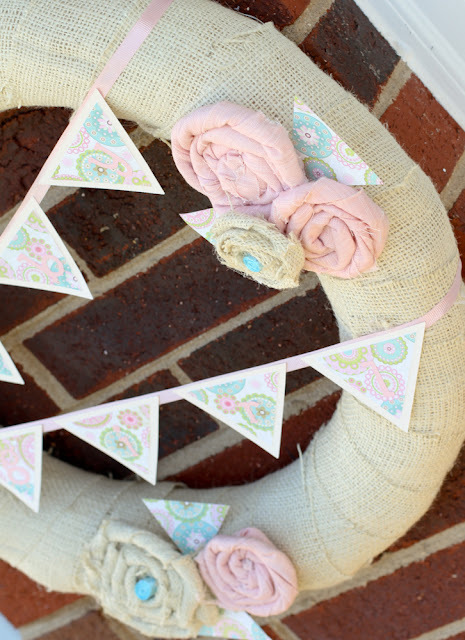 The baby girl pennant burlap wreath. Again, change the colors and words to make this wreath suit any occasion! I want to thank Vivienne again for having me! 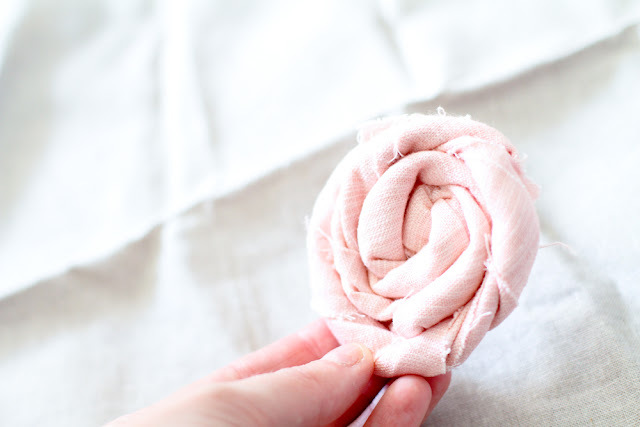 I hope y’all enjoyed my tutorial and I hope you’ll stop by to browse around my blog! Remember, you’ll get a little bit of everything at Scissors & Spatulas: And Everything in Between! Thanks Jen! I think this wreath is adorable and I’m so glad you shared it with us! Please go over and visit Scissors & Spatulas! You will definitely be inspired! this is so cute!! I have put the silouette on my wish list– but love all the wonderful things people are making with the cricut!!! Afreakin-dorable.. even if it is burlap which makes me sneeze like crazy!! That is so pretty. I do not like making flower wreaths but this I can do. Thanks for the inspiration! 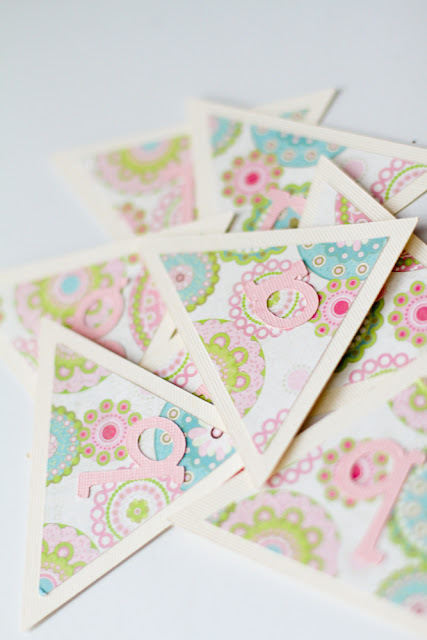 This is really cute for spring and easter! Have you ever done a Christmas Tree wreath using a wire hanger sandwich baggies a red christmas bow and lights? 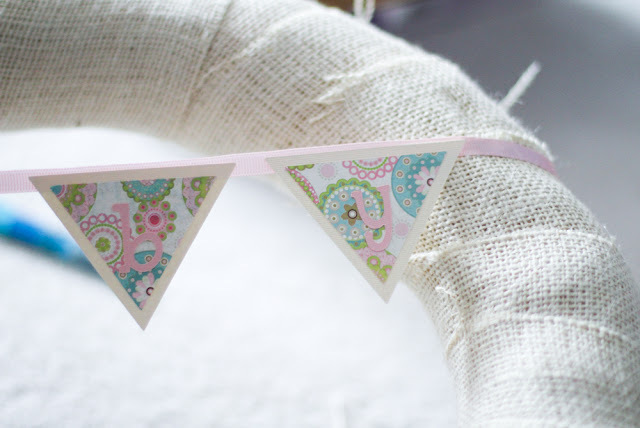 A cute DIY garden flag… just in time for Valentine’s Day!